Everyone in Seattle knows that summer doesn’t begin until July 5, and the weather forecast all week called for clouds today (but thankfully, no rain). Looking out the window this morning was a shock – could it be? Sunshine and blue skies on the 4th of July? What a delightful surprise, especially since the Friday sketchers were meeting at Queen Anne neighborhood’s Parsons Garden. 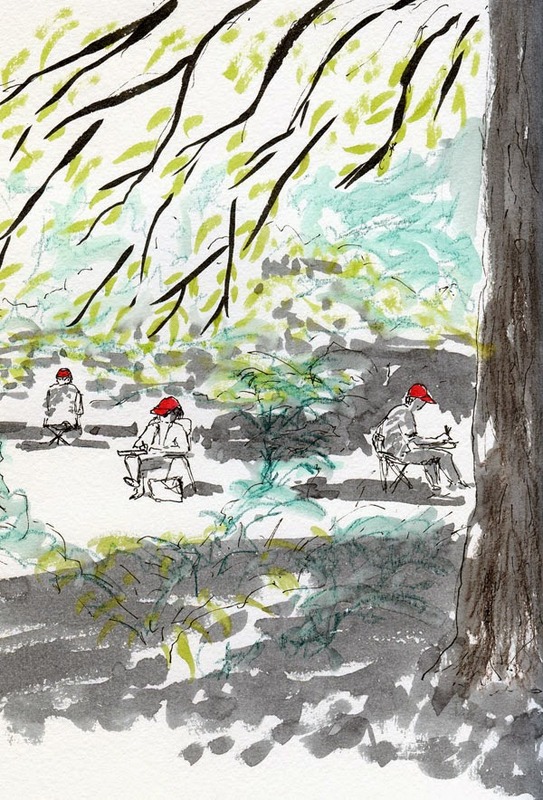 Once the meet-up began, I did an obligatory sketch inside the garden, and it was fun to catch so many sketchers in my sketch (I found my artistic license after all – no one’s cap was actually red!). But since I had just sketched there a few weeks ago, I didn’t have my heart in it, and I wasn’t in a garden mood. The wide skyline view had put me in the mood to tackle “the wall” again. After a sunny picnic on a park bench with a few other sketchers, I decided to take on one more quintessential Queen Anne neighborhood scene that has intimidated me in the past: again the same wall as the previous sketch, but this time from underneath it (at left). 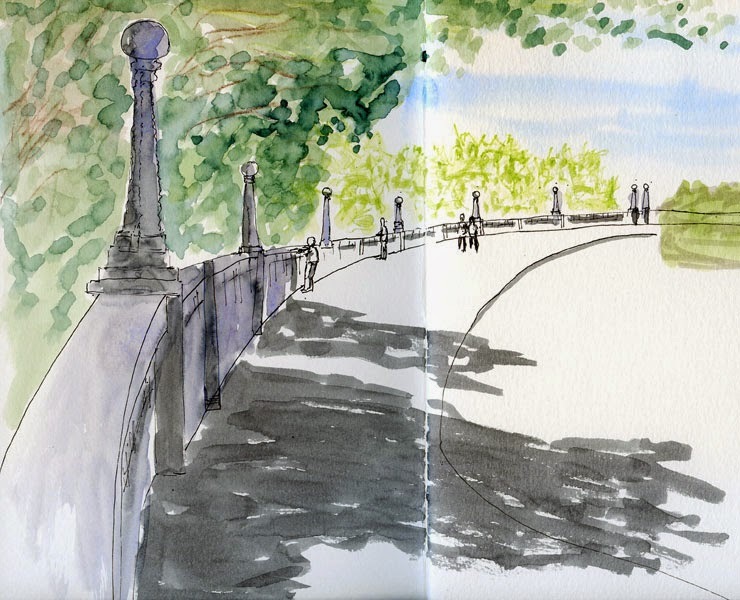 A long staircase leads from that curved upper path down to Eighth Avenue West and West Lee Street, where I stood to make this sketch. The wall has an interesting quilt-like pattern that I tried to indicate with crosshatching, but I liked the pattern enough to call it out in a detail. It’s now late afternoon, and right on schedule, the sky is clouding up, so by fireworks time, it should be completely overcast. All is right with the world after all. Happy Independence Day! My oh my how your sketches have grown.Great work Tina.